Permanent hair removal is achieved by means of a gradual destruction of the hair root via heat or chemical methods. The choice of which depends upon the hair growth and client tolerance. A fine probe is passed down the side of the hair into the follicle where a small current is discharged. 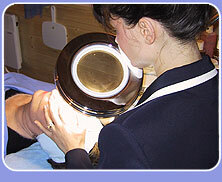 Over a period of time the hair growth weakens and the regrowth becomes lighter, finer and less dense, leading to a permanent removal.Cheryl is an advanced practitioner in methods of electrolysis and permanent hair removal and achieved Winning Tutor in the 1998 National Sterex Student of the Year Competition.